For almost 20 years, the United Nations climate negotiations have promoted the carbon market as the flagship ‘solution’ for climate change. However, this market allows corporations and governments to offset their pollution, without having to reduce the emissions at source. As a result, not only have global levels of the greenhouse gases that cause climate change increased, but also, large-scale projects implemented primarily in countries in the South to ‘offset’ the emissions of countries and corporations in the North have given rise to environmental devastation, the plunder of land and territories, social conflicts, and even violations of human rights. It is within the framework of carbon ‘offsets’ that negotiations began in 2005 around a mechanism for Reducing Emissions from Deforestation and Forest Degradation (REDD) and forest conservation, sustainable forest management and the enhancement of carbon stocks (REDD-Plus or REDD+). The Peruvian government has been one of the leading promoters of this mechanism since 2008. REDD+ assigns a monetary value to the capacity of the forest’s trees, plants and soils to ‘store’ carbon, imposing the logic of the carbon market on forests. In order to implement REDD+, changes must be made to existing legal frameworks related to forests, and therefore, to the territories of indigenous peoples and other communities who depend on forests. Peru participates in almost all of the international processes that promote REDD+, such as the World Bank’s Forest Carbon Partnership Facility (FCPF) and Forest Investment Programme (FIP), the UN-REDD Programme, and others. But, who benefits from REDD+? The ‘readiness preparation’ REDD+ documents in Peru almost always point to peasant farmers as the main agents of deforestation for clearing small parcels of land for subsistence agriculture. A recent analysis of satellite images from the eight Amazon countries that share the Amazon, excluding Brazil, reveals that Peru experienced the greatest loss of forests in 2012, with a 67% increase in deforestation as compared with the previous year. More than 65% of Peru’s indigenous territories and 49% of Protected Natural Areas overlap with oil blocks. At the same time, social conflicts and the criminalization of popular resistance are on the rise. The REDD+ documents do not look at the structural causes of these high rates of deforestation. These documents give no consideration to halting oil and gas extraction, or large-scale infrastructure projects like mega-dams, or industrial oil palm plantations. Instead of analyzing the ‘whys’ of deforestation, they cover up the responsibility of the agents responsible for the large-scale destruction of the Amazon, and lay the blame on the smallest and most vulnerable. The current map of mining projects of the Peruvian Ministry of Energy and Mines reveals that there are 50,516 mining concessions in force, and 49.6% of the territory of communities in the mountains overlaps with mining concessions. The resulting forced evictions, local contamination, criminalization of protest and other factors have pushed many communities to seek out other lands. In the meantime, 84% of the Peruvian Amazon region is covered by hydrocarbon concessions, while a decree issued in 2011 declared the construction of 20 large hydroelectric power stations along the Marañon River to be a matter of ‘national interest’. Most of the electricity will be exported to Brazil, while the rest will be used for mining megaprojects in the Andean region. Industrial oil palm plantations are also rapidly expanding in the Amazon. The greater deforestation and the more threats to the forests there are, the more REDD+ projects can be justified. Without challenging or questioning the current extractivist model, REDD+ projects not only generate carbon credits that allow the expansion and legitimization of the activities that are to blame for deforestation, in addition to creating lucrative financial speculation markets, but they are also dependent on this model. The implementation of REDD+ in Peru began in 2009 when it was selected as a pilot country for two World Bank programmes that zealously promote carbon markets: the FCPF and the FIP. These programmes offer financing for, among other things, opening up the countries of the South to the carbon market in connection with forests. In order to access FCPF funds, countries must submit a REDD+ Readiness Preparation Proposal (R-PP). Peru’s R-PP was accepted in 2011, although it still lacks final approval. The R-PP leads to a National REDD+ Strategy as well as a National Investment Strategy developed in the framework of the FIP. The FCPF and FIP also receive funding from the Inter-American Development Bank (IDB), several European governments, the United States and Japan, as well as private actors like the UK old giant British Petroleum (BP). History demonstrates, however, that these actors have facilitated activities that are underlying causes of deforestation, marginalizing peoples who depend on the forests. 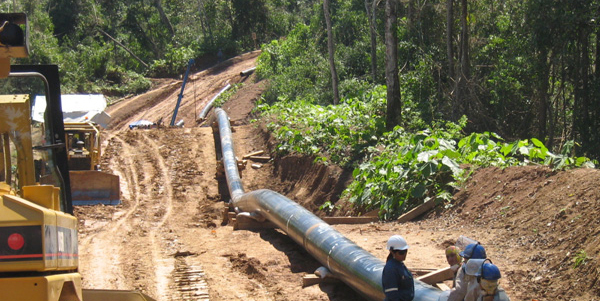 For example, the IDB also finances such destructive initiatives as the Camisea gas project and the rezoning of land for the expansion of oil palm plantations in the Amazon. So, if the agenda is to continue with a destructive extractivist model, then what are the real interests behind pushing forward REDD+ in Peru? In December 2012, the IDB provided the Peruvian government with US$1 million to ‘protect’ indigenous reserves for peoples living in voluntary isolation. However, the category of ‘indigenous reserve’, in accordance with national legislation, allows extractive activities if the government considers them to be a ‘public necessity’. In this way, funding is being provided for studies to re-categorize five territorial reserves, including the RTKNN, as indigenous reserves, exposing them to possible interventions. In addition, under the discourse of ‘protection’, the funds will also be used for “an analysis of avoided deforestation” on the reserves for peoples in voluntary isolation or initial contact – in other words, an assessment of carbon ‘stocks’. Also specified is the design of “a financial mechanism for their protection with the sale of carbon credits” through a REDD+ project. In 2002, in another attempt to clean up its image, the IDB approved a US$5 million loan to the government of Peru to strengthen its capacity to supervise and monitor the “environmental and social impacts of the Camisea project” and establish initiatives for “sustainable and harmonious development in its area of influence.” However, in 2003, it granted a loan of US$135 million to a private consortium for the construction of the main gas pipelines for the Camisea project, thus providing support for the “gas transportation component” of the project. In 2007, it approved a US$400 million loan to a private consortium headed up by Hunt Oil. REDD+, in reality, makes it possible to secure rights over the carbon credits on the reserve, while legitimizing extractive activities in the area. What is the ‘plus’ in REDD+? The ‘plus’ (+) in REDD+ refers to the inclusion of activities aimed at (1) conservation of forest carbon stocks, (2) sustainable forest management and (3) enhancement of carbon stocks. Although these may sound like positive proposals, the reality is that these ‘activities’ even further open up forested areas to the entry of corporations and private interests. During the 2008 UN climate negotiations, the Peruvian Ministry of the Environment (MINAM) announced the National Forest Conservation Programme (PNCB), with the objective of conserving 54 million hectares of forest, including protected areas, concessions for ecotourism and conservation, territorial reserves for indigenous people in voluntary isolation, and Amazon wetlands. The programme also set a target to reduce net deforestation to zero by 2020. With financial support from the German, U.S. and Japanese governments, the PNCB acts as the umbrella programme in which REDD+ would be included for ‘carbon dioxide sequestration’. Through the PNCB, the government of Peru is promoting an initiative through which indigenous communities would be paid around US$3.7 per hectare per year, during a five-year period, in exchange for the commitment to ‘guard’ the forests where they live. The agreements cover the total number of hectares of forests of the communities. They not only strip them of their autonomy and control over the use of their territories, but in addition, they create conflicts between and within communities as they require ‘monitoring’ and ‘policing’ among themselves. Meanwhile, the imposition of national parks or protected areas has also led to the forced displacement of local communities. In the forests of northern Peru, for example, the community of Nuevo Lamas has been resisting the Cerro Escalera Regional Conservation Area. The park authorities have restricted their access to the forest for hunting and gathering and prohibited their traditional system of shifting cultivation. In 2010, charges were brought against three members of the community for practicing this system of agriculture. In addition to Nuevo Lamas, there are other communities that depend on this area for vital forest resources. Charges have also been brought against eight members of the community of Alto Pucalpillo – where community members only have title to the area around their houses – for the deforestation of 0.25 ha in order to make a small campsite where they could grow food during hunting and gathering expeditions. According to a study currently in progress, there are at least 32 communities where the inhabitants have land titles that only cover their houses, and at least 13 that are not even officially recognized. Meanwhile, the 132,000-hectare Cerro Escalera Regional Conservation Area has been created alongside hundreds of thousands of hectares of private ‘conservation’ concessions granted to NGOs and private companies. REDD+ also fosters industrial logging operations and the establishment of monoculture tree plantations. FIP financing, for example, includes funds for the following actions: (1) granting forest concessions for the extraction of timber, preferably with ‘certification’, from organizations like the Forest Stewardship Council (FSC). This serves as a strong incentive for industrial logging, an activity that has already been heavily challenged in Peru by local communities, and is a significant cause of deforestation; (2) promoting ‘carbon positive’ agriculture, such as oil palm plantations, which already have national and international support as an alternative to plantations for drug trafficking; and 3) promoting large-scale tree plantations, including the recommended establishment of 250,000 hectares of plantations in Cajamarca and Huánuco, near San Martín and Ucayali. The controversial Conga mining project planned by Newmont-Buenaventura-World Bank (Minera Yanacocha) in the northern region of Cajamarca has become a symbol of the struggle to protect water. The proposed site for the open-pit mine is at the headwaters of a river basin that supplies five micro-basins, affecting more than 600 springs in addition to the imminent loss of numerous lakes, with drastic impacts on the population. As a result, the company is offering to ‘re-create’ the lakes with artificial reservoirs to ‘compensate’ for their destruction. However, it is impossible to make this replacement and much less to ‘compensate’ for the lost natural lakes with manmade reservoirs. Local communities and governments have been waging months of intense protests, for which they have been violently criminalized and pursued. Just as REDD+ generates a system of carbon offsets to compensate for atmospheric pollution, numerous markets are being promoted that would allow for other ‘services’ provided by nature to be marketed or even ‘re-created’ – such as, in this case, the water cycle. The idea that the destruction can be ‘offset’ is extremely dangerous and serves to cover up increased extraction and devastation. The foundations of REDD+ are rooted in the carbon market. REDD+ establishes the fragmentation of territories into commodities, now also including ‘environmental services’, biodiversity, water, and others. As hard as some may try to change its objectives, REDD+ is being financed, implemented and planned to serve as a carbon market mechanism. As with any market, investors are concerned above all with the “value” and quality of the merchandise. The experience of recent years has demonstrated that REDD+ projects establish packages of ownership rights over trees, plants, forests and soils to be appropriated by powerful actors. REDD+ is based on the premise that, without challenging the extractivist model or tackling the underlying causes, adding a monetary value to the carbon cycle will create sufficient incentives to reduce deforestation. This clearly does not work. Deforestation and forest degradation are driven by an economic logic of continuous ‘growth’ that depends on extraction and, therefore, large-scale deforestation and the plunder of communities who depend on forests. This same logic views the functions and cycles of nature as commodities; it views forests as tree plantations, and the many ‘values’ of forests as a single monetary ‘value’. This logic aims to blind us to the many possible options outside the framework of predatory capitalism. Let us not be caught up in the REDD trap!